Morpho South Africa has a strong presence in the residential estate market, with its biometric readers managing access to a number of estates around the country. Nicolas Garcia, sales manager of the company, recently sat on the panel at the Hi-Tech Security Solutions residential estate conference, discussing the issues around fingerprints for access control on estates. One of the questions posed was ‘what should be done if an estate’s visitor does not want to use fingerprint enrolment to gain access to the complex?’ Morpho, he says, has a wide range of products that allows control from the most basic to highly secure requirements. Solutions include hardware- or software-based fake fingerprint detection readers that check the ‘liveness‘ parameters in the finger as well as the fingerprint itself. Similarly, the company can offer diversified solutions including the combination of biometrics with embedded card readers and keypad if a pin is required for access, should it not be physically possible for a fingerprint to be read. Interestingly, it is often difficult to enrol small children on biometric readers. Morpho has overcome this with what it terms Juvenile Mode. When activated, it allows the reader to enrol smaller, thinner fingers where the fingerprint has not yet fully developed. He points out though that in instances where a fingerprint can be read but the guest chooses not to present their fingerprint, the biometric reader should backup the estate policy and not the other way around. In other words, it the estate policy is ‘no scan, no entry‘, the technology should allow for it. Morpho presented its full range of biometric readers from the compact range to its tablet options. 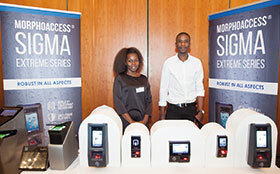 Forming the centrepiece of its display was the MorphoAccess SIGMA Extreme biometric reader. Launched at Securex, this rugged successor to the previous-generation Outdoor MorphoAccess 500 series, features a touchscreen and is IP65 rated. The video camera can not only perform the functions of an intercom but also provides mugshot photos and simple monitoring functionalities. Garcia explains that the Extreme provides three options: (1) fingerprint only; (2) best effort, which produces a mugshot of whoever/whatever is in front of the reader as a finger is presented; (3) face detection mode, whereby the reader first seeks out a definite face image and then takes a mugshot as a finger is presented to the reader. For more information contact Morpho South Africa, +27 (0)11 286 5800, sec.san.morpho@morpho.com, www.morpho.com.